The University’s campus carry policies and procedures went into place Aug. 1. 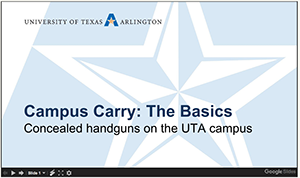 There is comprehensive information on the UTA campus carry website including a training presentation and current FAQs. Please familiarize yourself with the list of UTA’s exclusionary areas, and if you have questions, please address them to the campus carry committee through the form or the email address on the website. Please include your email address on the form if you request feedback. Parking permits are available now for students for the 2016-17 year. UTA's virtual parking management system, MAVPark, is an online service that increases efficiency for customers and eliminates the need for parking decals and paper citations. MAVPark uses vehicle-mounted license plate readers to identify license plate numbers of parked vehicles for comparison against the virtual database of permitted vehicles. To purchase a parking permit, visit uta.edu/pats and click on Obtain a Permit under the big blue P. Read more about parking options. UTA has appointed Greg Hladik as the new director of parking and transportation services as of Aug. 1. Hladik has served as interim director for the past three months. He brings more than a decade of progressive experience at UTA, formerly serving as assistant director of auxiliary services and of university housing. 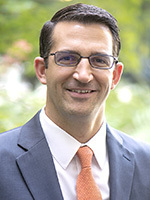 In his new role, Hladik will report to John Hall, vice president of administration and campus operations. Campus police previously oversaw parking administration and operations. Student organizations are encouraged to host an information table at the Maverick Cookout Featuring the Activity Fair Day on Wednesday, Aug. 31, on the University Center mall. Register online by Monday, Aug. 29. Interested in taking over UTA’s Snapchat account and showcasing a day in your #MaverickLife? Students who embody the diversity and Maverick spirit of UTA can participate in a takeover at bit.ly/UTASnap. First day of classes for fall semester. Registration continues for the fall semester. Advising is available in your academic department. The MyMav schedule of classes is being updated daily. Plan to validate your course selections closer to the start of the session. 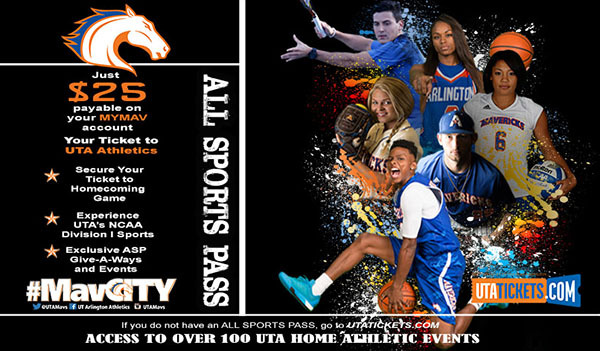 Maverick Stampede UTA's Welcome Week traditions return starting Monday, Aug. 22. See the calendar. 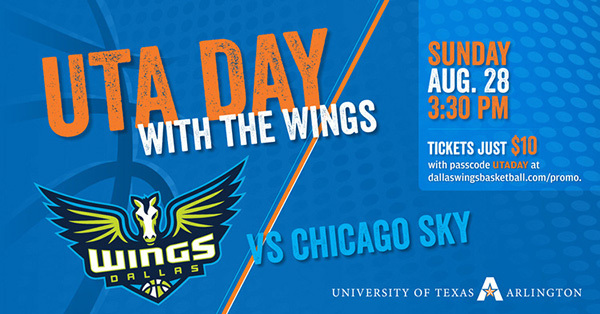 Dallas Wings Women's professional basketball. Tickets $25-50. College Park Center. Upcoming games are vs. Chicago Sky, 3:30 p.m. Sunday, Aug. 28; vs. Los Angeles Sparks, 7:30 p.m. Friday, Sept. 2; vs. Washington Mystics, 3:30 p.m. Sunday, Sept. 4; and vs. New York Liberty, 3:30 p.m. Sunday, Sept. 11. Dallas Wings. UTA Libraries: 'Building a Barrier-Free Campus' Explore how UTA became a model accessible campus for students with disabilities. Sixth floor parlor, Central Library. Through Sept. 16. UTA Libraries, History, College of Liberal Arts’ Festival of Ideas, Office for Students with Disabilities. Institutional Review Board (IRB) Mini-Conference Students, faculty, and staff can learn about the IRB submission process and regulations, hot topics in human subjects research, and a sampling of protocol case studies. Breakfast, lunch included. Conference schedule and RSVP. 9 a.m.-4:30 p.m. Friday, Sept. 9, sixth floor atrium, Central Library. Regulatory Services, Research Administration. Senior golfer Zach Galliford captured the Welsh Amateur Championship on July 29 in Ogmore By The Sea, Wales. Read more. Distance runner Katelyn Hayward, high jumper Alexus Henry, and men's triple jumper Tobi Fawehinmi were named to the 2015-16 USTFCCCA All-Academic Track and Field Team by the United States Track & Field and Cross Country Coaches Association. Read more. Golf coach Stuart Deane and associate coach Casey Devoll finished one and two at the TelePacific Communications Western Championship at Mira Vista Country Club July 19. Read more. Roy Rudewick, associate athletic director for sports medicine, received the Frank Medina Award for significant contributions to the profession at the Southwest Athletic Trainers' Association annual symposium. Read more. Season and single game tickets for the 2016 UTA volleyball season are now on sale at utatickets.com or by calling the College Park Center box office at 817-272-9595. The Mavericks open up their season at home hosting the Maverick Classic on Aug. 26-27 at College Park Center. Read more. Upcoming intramural sport deadline for MavStrong is Thursday, Aug. 11.